The New Orleans Saints will play three nationally televised games in prime time during the 2008 season, including two on Monday night and one on Thursday night. The team will open its season at the Superdome for the first time since 2004, according to the team schedule released April 15 by the NFL. And, for the first time since 1999, they have three home games in three weeks. Both Monday night games are at home — Oct. 6 against the Minnesota Vikings and Nov. 24 against the Green Bay Packers. The Saints play the Bears in Chicago on Dec. 11 in a Thursday night game. The Saints also will be the home team in an Oct. 26 game against the San Diego Chargers at London’s Wembley Stadium. After the Sept. 7 opener against the Tampa Bay Buccaneers, the Saints play at Washington and Denver, then return home games against San Francisco on Sept. 28, Minnesota on Oct. 6 and Oakland on Oct. 12. The New Orleans Saints are back in Jackson for pre-season practice now until August 17th, staying at Millsaps College. The New Orleans' Times Picayune newspaper has produced a short "Let the Good Times Roll" video which features a number of hot spots in and around Jackson. The music for the video is a live performance of "Let the Good Times Roll" performed by The Delta Rockets at the 930 Blues Cafe. The New Orleans Saints will return to Millsaps College for training camp this summer. Players will report to the campus on July 25, with the first practice scheduled for July 27 at 8:50 a.m.
After training in Jackson last summer, the Saints had their best season in franchise history, winning 10 games in the regular season and then coming within one victory of the super Bowl. Twenty-five practices are scheduled from July 27 through Aug. 19 but a detailed practice schedule has not been released yet. An estimated 15,000 fans attended the practice sessions last year. Admission is free, but on-campus parking is $5. 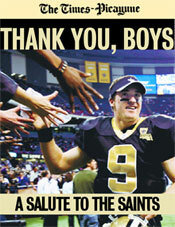 The Times-Picayune is offering a hardcover, full-color salute to the saints, Thank You, Boys. The 160-page book is full of color photographs, stats and stories. The limited-edition books began shipping on Feb. 15. The New Orleans Saints returned to the Superdome last night. The refurbished 72,000-seat Superdome is sold out for the season - a first in Saints history. Restoring the Superdome cost about $130 million in federal and state funds, which were used to replace the 9.7-acre roof, artificial-turf field, 500,000 square feet of ceiling tile and nearly everything else trashed by the storm. Snazzier scoreboards and other improvements, some unfinished, put the total cost at $185 million. The stadium wasn't expected to reopen until at least November, but Louisiana Gov. Kathleen Blanco suspended some contract requirements, accelerating construction. Outside roof work was interrupted by only five days of bad weather. The Superdome is now getting ready for another homecoming. Next Saturday, Tulane University's football team will play there, too, ending its streak of 14 straight road games in 12 different stadiums. The Saints are marching in! The New Orleans Saints will play in the Superdome against the Atlanta Falcons in a Monday Night Football showcase on September 25, featuring performances by U2, Green Day and the Goo Goo Dolls. Click here to see the Saints commercial the New Orleans Convention & Visitors Bureau and the NFL produced - it's airing in 32 U.S. television markets. When the New Orleans Saints report to training camp today in Jackson, it will serve as a homecoming of sorts for several players with Mississippi ties. Running back Deuce McAllister is a Morton native who starred at Mississippi and is entering his sixth season and is the Saints all-time leading rusher with 4,529 yards and 34 TDs. Receiver Joe Horn is a former Itawamba Community College standout and is a four-time Pro Bowl pick entering his 12th season. Return specialist Fred McAfee is a Mississippi College alum and Philadelphia native who is entering his 16th season and has been one of the NFL’s top special teams players the past decade. Defensive tackle McKinley Boykin is also a former Ole Miss player and is a two-time All-SEC pick. He is a rookie free agent signee who will be fighting for a roster spot in camp. Saints owner Tom Benson on June 22 announced a four-year deal with Millsaps College to hold the team's month-long preseason training camp at the school. Some of the team's practice sessions will be open to the public. The Saints will arrive this year on July 27 and will begin camp on July 28 at the college. They will be in Jackson until their August 26 preseason game against the Indianapolis Colts at Mississippi Veterans Memorial Stadium. The Saints considered training this summer at their facility in Metairie, La., but there was concern about hotel space around New Orleans. Running back and Morton native Deuce McAlister and special teams player and Philadelphia native Fred McAfee were both at the announcement. Players will practice twice a day at Millsaps with the second practice expected to be open to the public, according to an article by Michael Wallace in The Clarion-Ledger. They will also stay in dorms on the campus. The Saints are scheduled to play an Aug. 26 preseason game in Jackson against the Indianapolis Colts at Mississippi Veterans Memorial Stadium. They will play all of their 2006 home games in New Orleans. National Football League and state officials finalized a deal March 22 for the New Orleans Saints to host the Indianapolis Colts in an Aug. 26 exhibition game at Mississippi Veterans Memorial Stadium - our state's first in 10 years. The matchup will feature Colts quarterback Peyton Manning, a New Orleans native and a son of former University of Mississippi star (and ex-Saint) Archie Manning. The game will also serve as a homecoming for Saints running back Deuce McAlister, a Morton native who played at Ole Miss and has many business holdings in Jackson. Each NFL team plays four exhibition games each season. The games are played to help the team work their way into shape for the regular season. The Saints held a scrimmage at the stadium last summer.